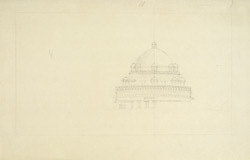 Pencil drawing of the dome of Sher Shah's Tomb at Sasaram in Bihar by an unknown artist between 1780 and 1820. Sher Shah Suri (1472-1545) was born in Punjab and rose from humble origins to become a Sultan of Bengal in the Mughal Empire of Babur. After Babur’s in 1530 death he took advantage of the problems faced by the Emperor’s son Humayun and eventually managed to overthrow the Mughal power. Although he only ruled for five years Sher Shah gained a reputation as a capable military and civilian administrator. His tomb was inspired by the one which was erected for his father, Hasan Khan by the master builder Aliwal Khan, c. 1535 and is an impressive monument constructed in grey sandstone in an octagonal plan and set in a large artificial lake so that it appears to float.